We pick our stand-out performers from Week One of the new campaign. St Patrick's Athletic midfielder Greg Bolger was excellent on Friday night. Brendan Clarke (St Patrick’s Athletic) – Last season’s Goalkeeper of the Year was solid on the opening night. Ryan McBride (Derry City) - A man-of-the-match performance for the Candystripes at Tallaght Stadium on Sunday. Sam Oji (Limerick) - The Limerick centre half was rock solid throughout – ensuring neither Byrne nor Akinade had a sniff. Alan Byrne (Athlone Town) – Made it difficult for Sligo Rovers, and was a rock at centre-back for Mick Cooke’s team. 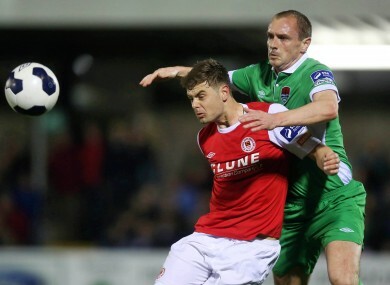 Daire Doyle (Drogheda United) – A sprightly debut for the close season signing from Bray. He was composed on the ball and offered a dangerous outlet from wide areas, especially in the second half. Made Drogheda’s second. John Russell (Sligo Rovers) – The midfielder worked tirelessly throughout the game, tackled well and was involved in both goals. Greg Bolger (St Patrick’s Athletic) – Ran the show from midfielder for the reigning champions. Paddy Kavanagh (Bohemians) – Scored a wonderful and was an ever-present creative outlet for Bohs. Jake Kelly (Bray Wanderers) – The lively natured winger made the first half his own, creating both stand out chances and keeping the Blues’ backline on their toes. Declan O’Brien (Drogheda United) – Just when you think the time has come for the veteran striker to take a back seat for the Drogs, he shows his renowned predatory instinct in front of goal. His brace here sealed the game. Dinny Corcoran (Bohemians) – Started ahead of veteran Jason Byrne and found the back of the net. Email “Here's our SSE Airtricity League Premier Division Team of the Week ”. Feedback on “Here's our SSE Airtricity League Premier Division Team of the Week ”.